The LF-Ch concept has a hybrid powertrain. MUNICH -- Lexus has released the name and a rendering of the entry-premium concept car that it will unveil at the Frankfurt auto show later this month. Called the LF-Ch, the concept previews a new five-door hatchback that the Toyota luxury brand is expected to launch to challenge the BMW 1 series and Audi A3. Although the concept is a gasoline-electric hybrid, the production model will likely offer hybrid, gasoline and diesel powertrains and front-wheel drive. 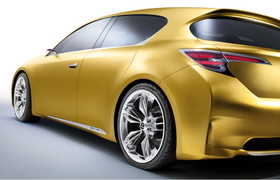 The LF-Ch five-door will debut in Frankfurt along with an updated LS model range and revised versions of GS, IS and IS F.